Mix both sides of the Kraft Fresh Take Italian Parmesan thoroughly. Coat cube steak with mixture. Fry in pan coated with cooking spray until meat is cooked completely. About 5 minutes before meat is finished toast two pieces of bread and spread with mayonnaise. 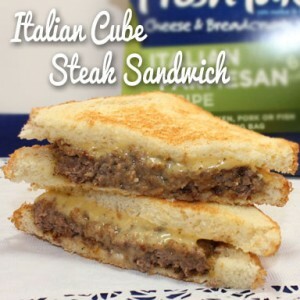 Top cube steak with cheese to melt and add to bread. My challenge was to us an old favorite sandwich recipe and revive it with the Kraft Fresh Take Italian Parmesan. I wasn’t sure if this was going to work but it turned out to be delightful. The Italian flavoring really gave the sandwich a kick it didn’t have before. I think you could also try this recipe with other Kraft Fresh Take flavors.